Love this blanket! 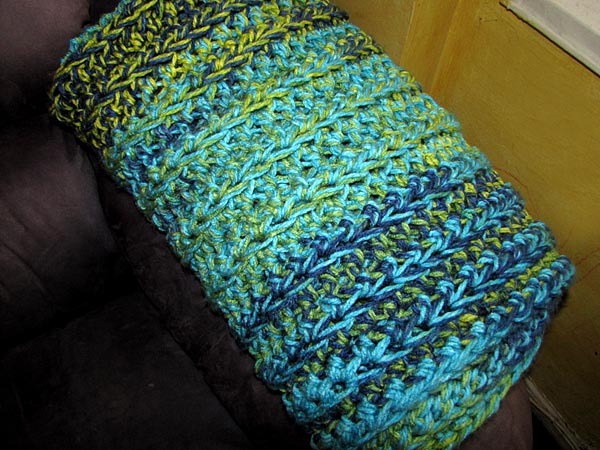 I love Loops & Threads yarn too, so now I have to shop for more of it! I’m glad you like the patterns. Stitches stand out like crazy with anything 12mm and up (and anything made with a hook 10mm or higher works up super fast). 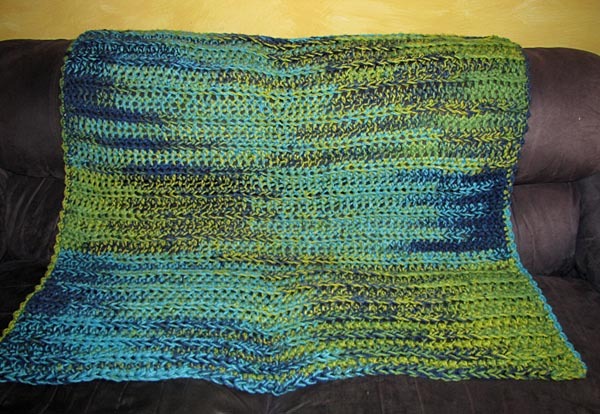 The blanket I made has been a big hit in my family. I’ve been thinking I need to make a few more since it’s been getting cold here in NY (where it is supposed to get cold) and they work up in like a second. I mean you could actually make 2 in one day if you really wanted to. By the way, speaking of BIG HOOKS, is the 10mm an O, P, or Q hook? I have an N-hook (9mm), & was wondering if that would work for the border…? The next size up that I have is the S-hook (19mm). The 10mm I have is an N hook. Sometimes the M hook is 9mm, sometimes the N hook is 9mm. Speaking to the owner of my local yarn store, it sounds like it changes every few years or by brand. 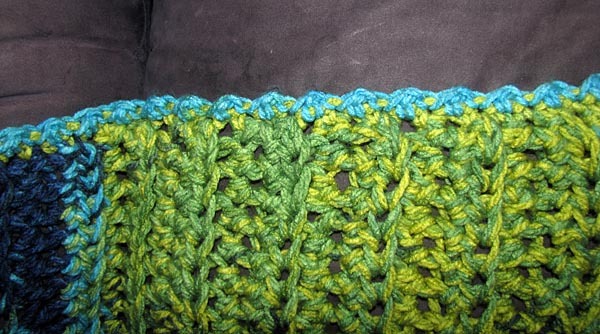 A 9mm hook should be fine to work the border with. 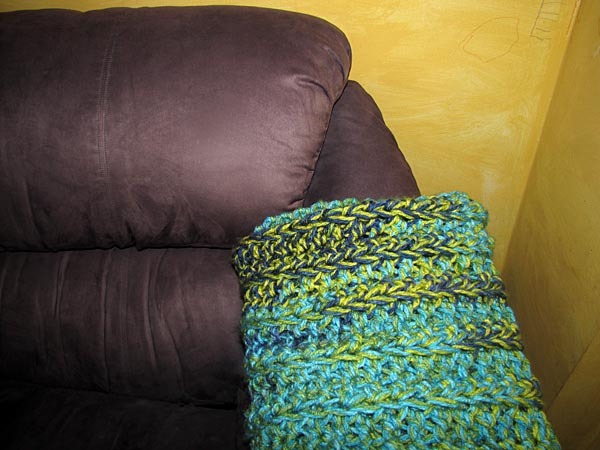 I made this in the same measurements but had to use twice the amount of yarn. 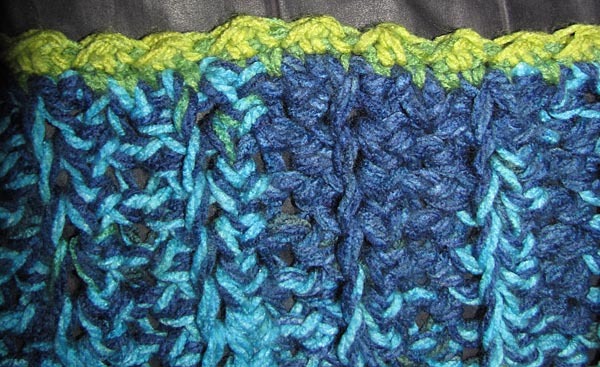 My gauge was close – I got the same measurements with the same number of foundation stitches across and the same number of rows. Any thoughts on why it took me so much more yarn? I’m not sure. Did you use Charisma or a different yarn? Found this yarn on super discount clearance, and had no idea what I was going to make with it… but I loved the colors, so I bought all the skeins. Googled Sunny Day Charisma to find this amazing blanket! Made it! Although my color pattern differs GREATLY from yours, I love it. (I think the distance in the dye has changed over the years?) It is soft, warm, and super fluffy! Anyway, thanks for sharing this awesome pattern, my niece is going to love her new blanket!